(Newser) – Idaho's move to let companies offer health insurance plans that don't meet Affordable Care Act standards is illegal, US officials say. Centers for Medicare and Medicaid Services Administrator Seema Verma issued a letter to Idaho officials saying the Affordable Care Act remains the law and that her agency has a duty to enforce it, the AP reports. 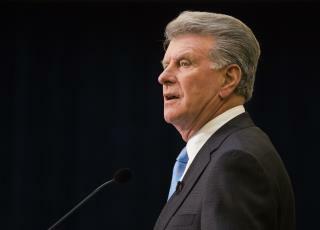 Idaho Gov. C.L. "Butch" Otter and other officials announced earlier this year that they would begin allowing insurers to offer plans that don't meet all of the act's regulations, such as by charging people more based on their health history, or by not covering some health needs like maternity care. Idaho Blue Cross soon played along by offering five "Freedom Blue" health plans for Idaho, NPR reports. In the letter, Verma said such a move would force the federal agency to enforce the provisions of the Affordable Care Act on behalf of the state. That could include pulling regulatory authority from the Idaho Department of Insurance and fining insurance companies $100 a day for every person they insure on a non-compliant plan. Verma said her agency was sympathetic to Idaho officials' concerns and outlined options that she believes Idaho could legally take, like allowing consumers to buy short-term plans that skirt Obamacare rules. The Obama administration limited such plans to 90 days, but President Trump is seeking to expand them to up to a year. That's Ed Begley Jr. in the photo. Who cares what federal law says anymore, California has led the way to disregard anything coming from them.